“Remember the Sabbath and keep it holy.” Sounds nice, but how do we find rest in a 24/7 world? 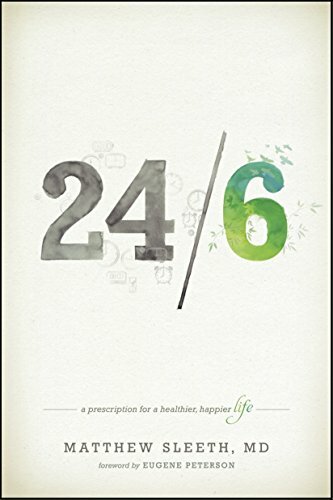 In 24/6, Dr. Matthew Sleeth describes our symptoms, clarifies the signs, diagnoses the illness, and lays out a simple plan for living a healthier, more God-centered life in a digitally-dazed, always-on world. Our technological tools allow 24-hour productivity and connectivity, give us more control, and subtlety enslave us to busyness itself. Sabbath is about restraint, about intentionally not doing everything all the time just because we can. Setting aside a day of rest helps us reconnect with our Creator and find the peace of God that passes all understanding. The Sabbath is about letting go of the controls one day a week and letting God be God. So how do we do it? Sleeth shares how his own family was dramatically transformed when it adopted Sabbath practices and helps readers better understand how their own lives can be transformed – physically, emotionally, relationally and spiritually – by adopting the 24/6 lifestyle. Notes: The first chapter points out how the “day of rest” has been lost in the sea of new technology, progress, and a culture that has become focused on constant stimulation. To me, this chapter makes me consider how big of an impact observing the Sabbath would have on my life. The author pointed out how one day a week, 52 weeks a year, over an 80 year life span adds up to 11 years! What am I spending that11 years on now? Note: In this chapter, the author addresses the controversy surround what day should be the Sabbath. He talks about the change in calendars, if we need to observe Sabbath on the same day of the week as Moses, and if it’s possible to even determine what day of the week that was. He also talks about how, even though nothing tangible was created on the seventh day, there was definitely still a creation. Note: This chapter reminded me that God didn’t rest because he needed to, but perhaps it was because he knew that we needed to. He set the example for what was made a commandment. Notes: In this chapter, the author talks about how God taught the Israelites about the day of rest, and how the 4th commandment is significantly longer than most of the other commandments. What stood out to me was how the Rabbis tuned something that was holy and added a bunch of other “derivative sabbatical rules” in an attempt to enforce it–some religious leaders considered pooping to be work. All that did was make it a chore to make sure you weren’t breaking the Sabbath. I think it is important that, when obeying the Sabbath, it isn’t about following the letter of the law; it’s about following the spirit of the law. Notes: This chapter was about time and how we have to spend our time on earth. In the beginning of the chapter, it started out with a story about a little girl named Naomi and how she had started having should pain that was unbearable from her practice at field hockey. Turns out she had a tumor in her chest, and she died a few months later and as Christians we need to realize that our actual life begins after we die and go to heaven so we have to develop a new mindset for our short time here on earth. Note: This chapter talks about how much emphasis we place on work and how we need to utilize our day of rest. Note: It is very important for pastors to observe the Sabbath, even if that means their Sabbath is a different day of the week. And the Sabbath is to be given away, not hoard. Note: This chapter talked about being good examples for our kids and modeling the Sabbath for them. And the fact that keeping the Sabbath is as much for the kids as it is for the parents. Note: In adopting the 24/6 lifestyle we are putting God back in the equation. Hard times will come to us in this life, keeping a Sabbath helps us to keep our focus on God.